Regarded and recognized as a top health system in the country for the clinical quality consistently provided to patients in our hospitals, nonprofit Banner Health is headquartered in Phoenix, Arizona, and operates 28 hospitals, including three academic medical centers and other related health entities and services in seven states. With nearly 300,000 members currently served by the Banner Health Network, a number that is anticipated to significantly increase, Banner has demonstrated the ability to effectively manage the health and wellness of populations of insured members in both government and private plans. Through Banner Medical Group, Banner has also expanded convenient access to quality care by placing health centers and clinics throughout the communities we serve. One of the largest nonprofit hospital systems in the country. Twenty-nine acute-care hospitals and health care facilities. 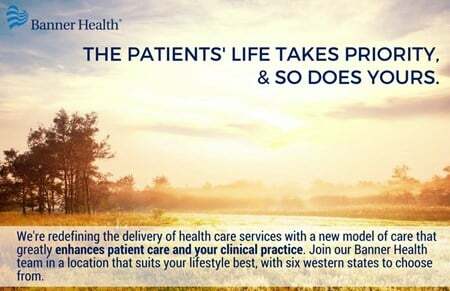 With more than 48,000 employees, Banner Health is the largest private employer in Arizona and third largest employer in the Northern Colorado Front Range area. We offer comprehensive services, physician services, hospice and home care. Our research is internationally recognized. We operate in seven states: Arizona, California, Colorado, Nebraska, Nevada and Wyoming. We are headquartered in Phoenix, Arizona. Our address is 1441 N. 12th St., Phoenix, Arizona 85006. Named a Top 5 Large Health System three out of five years by Truven Analytics (formerly Thomson Reuters). Twenty-one of our hospitals are at the highest level of electronic medical records. At our 55-bed simulation medical center -- the largest "virtual hospital" of its kind -- our health care providers can enhance their skills and training. Banner Health is the first health care provider in Arizona and Colorado to use technology to monitor patients from hundreds of miles away using Banner Telehealth. Research in the prevention and treatment of Alzheimer's disease conducted by the Banner Alzheimer's Institute and the Banner Sun Health Research Institute has resulted in two grants of nearly $50 million to support BAI's innovative approach and leadership in the field of Alzheimer's disease prevention. We provide $84 million a year in charity care.